The Beatles released their album, Sgt. Pepper’s Lonely Hearts Club Band, during the “Summer of Love” on June 1, 1967. Sgt. Pepper was unlike any album of its time. It was considered unprecedented in many ways due to the innovative ideas and musical techniques presented on the album. The album cover, the printed lyrics, the musical composition, the lyrical contents and the overall concept of the album proved upon its release to have a great impact on popular music as well as on the rest of popular culture. Considering the attention it was given through prestigious publications such as Newsweek, Time, The New York Times and The Washington Post illustrates that it was recognized as a significant event in the history of the 1960s. 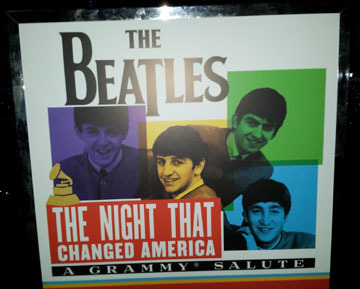 The music industry honored The Beatles monumental achievement at the GRAMMY Awards given in 1968. Sgt. Pepper won for Best Engineered Album, Best Pop Vocal Album, Best Contemporary Rock and Roll Performance, Best Album Cover and Album of the Year. The album’s revolutionary and brilliant qualities were praised. In 1993, the album entered the GRAMMY Hall of Fame. Sgt. Pepper was considered the first of its kind in many respects. For example, Sgt. Pepper became one of the first rock albums to eliminate the periods of silence traditionally heard between songs. As a result, the concept of the album was to recreate a concert-like performance of the make-believe Sgt. Pepper’s band. Also contributing to the uniqueness of Sgt. Pepper was the album cover. It was a collage of The Beatles surrounded by famous historical, literary and entertainment figures ranging from Edgar Allan Poe to Marilyn Monroe to Bob Dylan. Apparently, the Beatles’ record company, EMI, obtained permission from each celebrity to include them on the cover. Musically, this was an extraordinary album not just because of the complex musical arrangements, but also because of the wide variety of instruments used ranging from an electric guitar to a 41-piece orchestra. The lyrics of the songs had a great effect because of the many ways they could be interpreted. Sgt. Pepper marked the first time that the lyrics were printed on the cover of a major pop release. As a result, the printing of the lyrics put a greater emphasis on the meaning of the songs. Consequently, this rock album, which had several different aspects to analyze, received near-unanimous raves and very little criticism. Throughout the States, it was widely agreed upon that Sgt. Pepper was a superior achievement for The Beatles. Taken along with the Beatles’ previous successes, Sgt. Pepper‘s release created an outpouring of esteemed praise for The Beatles. The majority of critics had a similar positive response to the album. Obviously, the most influential part of the album was the music. 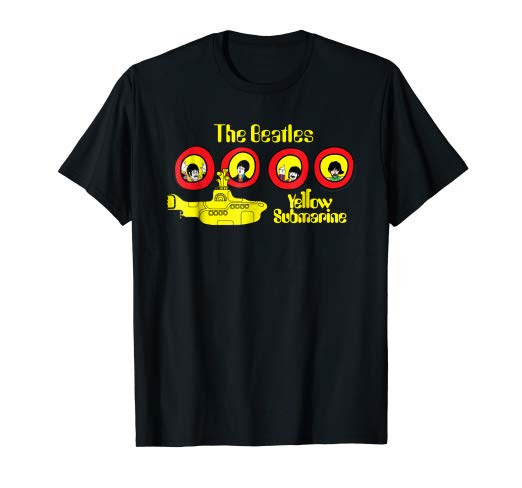 In The Washington Post (6/18/67), Carl Bernstein expressed his view of this amazing creation: “The Beatles have managed to create a musical infinity through a miraculous metamorphosis of dozens of Eastern and Western musical ideas, some centuries old, others from our own era and more than a few from the future.” It was the opinion of many critics that Sgt. Pepper was the most amazing rock album to date. However, the real proof that Sgt. Pepper was an astounding musical achievement rested in the views of other musicians. Surprisingly, in the classical music world, Sgt. Pepper received great praise. According to Time (9/22/67), classical conductor Leonard Bernstein declared that the song “She’s Leaving Home” was one of the three great songs of the century. Also, Time reported that classical composer Ned Rorem claimed that this song “is equal to any song that Schubert ever wrote.” Rorem also insisted that the best songs on Sgt. Pepper could compare with those by composers Monteverdi, Schumann and Poulenc. Meanwhile, within the rock world, the reaction was just as great. According to the authors of The Love You Make: An Insider’s Story of the Beatles (1983), after first hearing Sgt. Pepper, The Beach Boys’ Brian Wilson gave up working on his own upcoming album since he believed Sgt. Pepper to be the greatest album ever made and nothing could top it. If imitation is the highest form of flattery, then The Who and The Rolling Stones greatly admired The Beatles’ Sgt. Pepper. They both took up the challenge of matching it with their albums, Tommy and Their Satanic Majesties Request. Some fans of The Beatles also saw Sgt. Pepper as a prelude to the inevitable commercial exploitation of the counterculture. According to Schaffner, Robert Somma in Crawdaddy criticized The Beatles because “they tidied up the drug scene, made psychedelia as palatable and mind-blowing as Congress.” Nonetheless, these criticisms were among the few that appeared amidst the plethora of praise for Sgt. Pepper. Not only did Sgt. Pepper promote good and bad reviews for itself, but it created a new form of criticism for all rock albums which came thereafter. Following the strong reaction to Sgt. Pepper, serious critical reviews on rock albums came into existence. Prestigious publications started including commentaries on The Beatles and rock music in their issues. Until then, the only source of rock journalism came from fan magazines and the underground press. After Sgt. Pepper, a whole new genre of critical review emerged leading to the birth of magazines such as Rolling Stone and Crawdaddy. The majority of America looked favorably on the release of Sgt. Pepper. The most enthusiastic were the youth of America or the counterculture. With the release of Sgt. Pepper, the youth of the sixties believed that the Beatles were the spokesmen for the counterculture. The hippies studied and dissected the album, believing that it held prophecies, messages and signs for them. According to Jon Wiener in his book Come Together: John Lennon in His Time (1984), Robert Christgau, a writer for the music magazine Cheetah, claimed that Sgt. Pepper served as a “catalyst for the entire youth movement.” Sgt. Pepper was considered to be the perfect soundtrack for the “Summer of Love.” It managed to express almost every aspect of the merging youth subculture. The cover story in Time (9/22/67) summarized the main messages the album relays: “tension between the generations, the loneliness of the dislocated ’60s, and the bitter sweets of young love in any age.” The youth movement could strongly identify with these messages. Not only did the younger generation respond to Sgt. Pepper, but for the first time the older generation took a serious look at the Beatles and their music. Sgt. Pepper caused many adults, including parents, professors and business executives, to start taking the Beatles and rock music seriously. It was the first rock album that many people bought, and consequently, average adults started to formulate their own views on the Beatles’ music. This sudden change in perspectives on rock music may have been strongly influenced by the gradual progression of the Beatles’ music. The sharp contrast from the Beatles’ earlier music to the later music of Sgt. Pepper was a drastic change from simplicity to complexity. This metamorphosis, which also reflected the changing of the times, resulted from The Beatles desire to grow, experiment and expand their horizons. Sgt. Pepper’s Lonely Hearts Club Band definitely set a new standard of achievement in popular music due to the immense positive response it received almost everywhere. As Jim Hoagland declared in The Washington Post in 1967, “music may never be the same again.” And it wasn’t. In 1987, on its 20th anniversary, it was voted the greatest album of all time by a worldwide panel of critics. Looking back on the album in retrospect, it obviously had weaknesses. Richard Harrington claimed in The Washington Post in 1987 that the only songs that hold up well are: “With A Little Help From My Friends,” “She’s Leaving Home,” “Getting Better” and “A Day in the Life.” However, he still agreed that the album had tremendous influence over the music industry and the American public. The music industry changed in several ways after the release of Sgt. Pepper. Since the album took four months to make at a cost of approximately $100,000, the record business began its transformation into a billion dollar industry. Consequently, the album format was emphasized, and recording and marketing techniques were reshaped. After Sgt. Pepper introduced the idea of a “concept album”, this idea was widely imitated. Also no respectable rock star would ever again put out a dull album cover. Immediately following Sgt. Pepper, there was an unprecedented amount of freedom of expression in rock songs. Due to the acceptance of rock as art, every major album could expect to be critically analyzed and examined like a new novel. This criticism is still prevalent today in such magazines as Rolling Stone, which also celebrates its 50th anniversary this year. Sgt. Pepper also inspired a new age of studio experimentation and lavish productions. It is generally recognized that with Sgt. Pepper, the Beatles reached their peak in regards to experimentation and influence. This album was definitely seen as a turning point in the music industry. Concerning American society, Sgt. Pepper also had a great influence. The music seemed to distill the moods of that time. It opened up the eyes of the people, young and old. The album accurately personified the psychedelic sixties. It reflected the beliefs and thoughts of the people, especially the youth. Will there ever be another album/CD that will have as enormous an impact as Sgt. Pepper did? Judging from the 50 years since Sgt. Pepper‘s release, that seems highly doubtful. Copyright Daytrippin’. No part of the article text may be reprinted without permission from the author. Categories: Anniversary, Beatles History | Tags: 50th anniversary, album review, beatles, beatles 1967, beatles album, beatles album review, john lennon, Paul McCartney, sgt pepper, sgt pepper 1967, sgt pepper 50, sgt pepper review, the beatles | Permalink. On July 14, 2016, Paul McCartney, Ringo Starr, Yoko Ono and many more celebrities gathered in Las Vegas to celebrate the 10th anniversary of The Beatles LOVE show by Cirque du Soleil. The audio and visual experience of the show has been revamped and enhanced to give the production a fresh look. 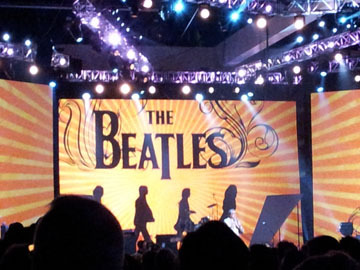 The updated version of LOVE, which features a cast of 70 performers, includes advanced projection technology, new acrobatic acts, a remixed soundtrack with a new song (“Twist and Shout”), colorful costumes, brand new speakers and state-of-the-art video panels featuring The Beatles’ images. Also in attendance was Ron Howard, director of the upcoming documentary, The Beatles: Eight Days a Week – The Touring Years, and he shared some insights on the making of his film which opens in September. He said he has interviewed Paul McCartney and Ringo Starr twice for the movie which documents The Beatles’ years on the road. Categories: Anniversary, Beatles News, Beatles Travel: USA | Tags: 10th anniversary, beatles, beatles love, cirque du soleil, giles martin, las vegas, Paul McCartney, ringo starr, ron howard, yoko ono | Permalink. July 6, 2014 is the 50th anniversary of the premiere of A Hard Day’s Night! A special 50th anniversary DVD and Blu-ray edition is being released by the Criterion Collection for the 50th anniversary of the film. This latest release features new 4K restoration from the original camera negative and a new 5.1 surround sound mix produced by Giles Martin. The film is also being shown in select theaters this Fourth of July weekend. Listen to the full mystery ‘train song’ from A Hard Day’s Night – Is it The Beatles? Don’t Forget to SUBSCRIBE to the Daytrippin’ BLOG !! Most products mentioned contain affiliate links. This website makes very small earnings when you click and/or buy a product through one of the links. These earnings help with the maintenance of this website. Your support is appreciated! 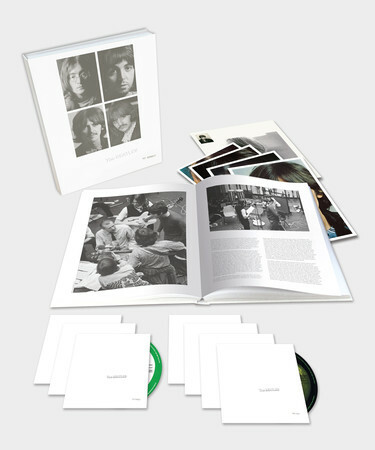 Categories: Anniversary, Beatles News, New Beatles merchandise | Tags: 50th anniversary, a hard day's night, beatles, blu-ray release, dvd release | Permalink.